Huangshan City is small and not as modern as the metropolis, but shopping is always connected with tourism. Besides, with the profound historical and cultural influence of the Mountain Huangshan (Yellow Mountain), the city boasts of varieties of local special products. The followings are the famous shopping areas and major local special products with high reputation in the city. Located in Tuinxi Old Street, and being part of Hukaiwen Ink Stick Factory, Yilinge mainly deals in famous Hui ink stick. Founded in the 47th year of Qianlong reign of Qing Dynasty (1782), Hukaiwen Ink Stick Factory is the sole State Owned Enterprise in the ink stick industry. Now Hukaiwen Ink Stick Factory in Tunxi possesses Chinese-foreign joint venture - Tianyun Restaurant, Shezhou Ink Slab Factory, Hukaiwen Old Store, Process Package and Decoration Factory as well as Yinlinge Store. Till now, Yilinge has been keeping nearly ten thousand top-quality moulds of thousands of types descended from generations, and its products have a ready market in Japan, Southeastern Asia, Europe and America. In 1994, the new-created super tiny soot Hui ink stick of pure materials, excellent formula and new craft reached the highest quality level in history. Also called "Song Xity", and the intact old business street in modern China, this street is 1,273 m long and lined with 257 stores. In this business pedestrian street with Ming and Qing architectural styles, tea houses, restaurants, storytelling places, ink stick stores, boards and banners, row upon row of horse-head style walls, ochre street of profound implications, shop fronts in graceful disorder and time-honored shops, all embody deep culture of Huizhou and distinguished demeanor of Anhui merchants. 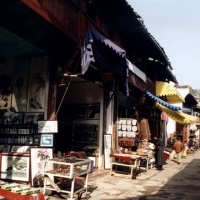 Situated in Pinghu Road, Huangshan District between Huangshan Mountains and Taiping Lake, this market mainly deals in tea, local specialties, tourist souvenirs, and other commodities. Inside the old city of She County of Huangshan City, it is the most prosperous business pedestrian street lined with stores of antique flavor. Some famous ancient buildings like Xuguo stone mill, Nanqiaolou and Dongqiaolou stride on this street, where is also close to Tao Xingzhi Memorial Hall, Doushan Street - the hometown of Anhui merchants. 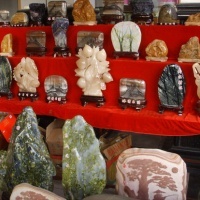 Huangshan city boasts of varieties of local specail products. The followings are the major local special products with high reputation in Huangshan City. Huangshan Treasures, China Travel TourIn Huangshan, the most popular items to buy are "the four treasures of the study", including paper, ink stick, writing brush and ink slab. Shexian County produces one of the nation's best-known ink slabs, and is also known for its ink sticks, the best of which are produced in the old Hukaiwen Store. The xuan paper produced in Jingxian County is the best material available for traditional Chinese calligraphy and painting, and the xuan writing brushes are also marked for their superb quality. If you are a Chinese art lover, don't forget to take some of these stuffs back home. Huangshan Tea, Shopping in Huangshan, Tour ChinaMt. Huangshan is a famous tea producing area in China. The soil quality, weather, temperature, and degree of humidifies of the Yellow Mountain are very suitable to the growth of the tea trees. Tea from this area is well known overseas and Huangshan tea is famed for the quality. 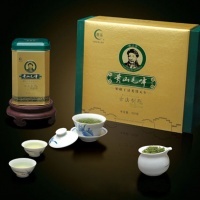 Huangshan Maofeng is regarded as the top ten green-tea of China. Huangshan Anhui, China ToursMt. Huangshan is the birthplace of the Huangshan School of painting. Ming and Qing artists such as Li liufang, Shi Tao, Jian Jiang, and Mei Qing lived alone on the mountain to draw inspiration from the beautiful landscape and to enrich their creativity. With compact strokes, graceful outlines, and elegant style, they formed a unique school. Today, there are modern Chinese artists who follow the Huangshan School and express their emotion through their drawings to create a spiritual but inspiring artistic rendition of natural beauty. Their paintings are of great value. The three most famous styles of carving in Huizhuo use brick, stone, and wood. The three styles originated in the Song Dynasty and reached their peak in the Ming and Qing Dynasty. The carvings are mainly used as decorations for homes, ancestral temples, and archways. Apart from the above mention, you can buy the other local specialties, such as the glossy ganoderma mushroom (a kind of precious traditional Chinese medicine grown on cliff), loquat, Chinese gooseberry (a kind of popular fruit in China that is rich in vitamins), tribute chrysanthemum, wild walnut, dried bamboo shoots, ferns, potted landscape of Huizhou, bamboo sculpture, four famed fruits: snow pears of Huizhou, Santan loquats, Jiekou tangerines, amber candied dates are all of great fame at home and abroad.